After its primary service with SAC ended, B-50 airframes were modified into aerial tankers for Tactical Air Command (KB-50) and as weather reconnaissance aircraft (WB-50) for the Air Weather Service. Both the tanker and hurricane hunter versions were retired in March 1965 due to metal fatigue and corrosion found in the wreckage of KB-50J, 48-065, which crashed on 14 October 1964. Development of an improved B-29 started in 1944, with the desire to replace the unreliable Wright R-3350 Duplex-Cyclone engines with the more powerful four-row, 28-cylinder Pratt & Whitney R-4360 Wasp Major radial engine, America's largest-ever displacement aircraft piston engine in large-scale production. A B-29A-5-BN (serial number 42-93845) was modified by Pratt & Whitney as a testbed for the installation of the R-4360 in the B-29, with four 3,000-horsepower (2,200 kW) R-4360-33s replacing the 2,200-horsepower (1,600 kW) R-3350s. The modified aircraft, designated XB-44 Superfortress, first flew in May 1945. 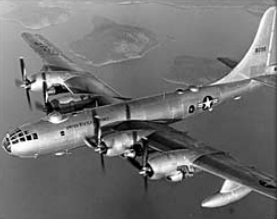 The planned Wasp-Major powered bomber, the B-29D, was to incorporate considerable changes in addition to the engine installation tested in the XB-44. The use of a new alloy of aluminum, 75-S rather than the existing 24ST, gave a wing that was both stronger and lighter, while the undercarriage was strengthened to allow the aircraft to operate at weights of up to 40,000 pounds (18,000 kg) greater than the B-29. A larger vertical fin and rudder (which could fold to allow the aircraft to fit into existing hangars) and enlarged flaps were provided to deal with the increased engine power and weight, respectively. [nb 1] Armament was similar to that of the B-29, with two bomb bays carrying 20,000 pounds (9,100 kg) of bombs, and a further 8,000 pounds (3,600 kg) externally. Defensive armament was 13 × 13 mm (.50 in) machine guns (or 12 machine guns and one 20 mm (0.8 in) cannon) in five turrets. First flying in May 1945, the sole XB-44 proved 50–60 mph (80–100 km/h) faster than the standard B-29, although existing sources do not indicate how much of this increased speed was due to differing aircraft weight due to deleted armament or increased power due to the R-4360-33 engines. An order for 200 B-29Ds was placed in July 1945, but the ending of World War II in August 1945 prompted mass cancellations of outstanding orders for military equipment, with over 5,000 B-29s canceled in September 1945. In December that year, B-29D orders were cut from 200 to 60, while at the same time the designation of the aircraft was changed to B-50. Officially, the aircraft's new designation was justified by the changes incorporated into the revised aircraft, but according to Peter M. Bowers, a long-time Boeing employee and aircraft designer, and a well-known authority on Boeing aircraft, "the re-designation was an outright military ruse to win appropriations for the procurement of an airplane that by its B-29D designation appeared to be merely a later version of an existing model that was being canceled wholesale, with many existing examples being put into dead storage." The first production B-50A (there were no prototypes, as the aircraft's engines and new tail had already been tested) made its maiden flight on 25 June 1947, with a further 78 B-50As following. The last airframe of the initial order was held back for modification to the prototype YB-50C, a planned version to be powered by R-4360-43 turbo-compound engines. 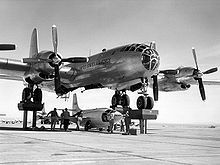 It was to have a longer fuselage, allowing the two small bomb bays of the B-29 and the B-50A to be replaced by a single large bomb bay, more suited to carrying large nuclear weapons. It would also have longer span wings, which required additional outrigger wheels to stabilize the aircraft on the ground. Orders for 43 B-54s, the planned production version of the YB-50C, were placed in 1948, but the program was unpopular with Curtis LeMay, commander of Strategic Air Command (SAC), as being inferior to the Convair B-36 Peacemaker and having little capacity for further improvement, while requiring an expensive redevelopment of air bases owing to the type's undercarriage. The B-54 program was therefore canceled in April 1949, work on the YB-50C being stopped prior to it being completed. While the B-54 was canceled, production of less elaborate developments continued as a stopgap until jet bombers like the Boeing B-47 and B-52 could enter service. Forty-five B-50Bs, fitted with lightweight fuel tanks and capable of operating at higher weights, were built, followed by 222 B-50Ds, capable of carrying underwing fuel tanks and distinguished by a one-piece plastic nose dome. To give the Superfortress the range to reach the Soviet Union, B-50s were fitted to be refueled in flight. Most (but not all) of the B-50As were fitted with the early "looped hose" refueling system, developed by the British company Flight Refuelling Limited, in which the receiving aircraft would use a grapple to catch a line trailed by the tanker aircraft (normally a Boeing KB-29) before hauling over the fuel line to allow transfer of fuel to begin. While this system worked, it was clumsy, and Boeing designed the alternative Flying Boom method to refuel SAC's bombers, with most B-50Ds being fitted with receptacles for Flying Boom refueling. Increased fuel capacity with underwing fuel tanks being added. The mission of these wings was to be nuclear-capable and, in wartime, be able to deliver the atomic bomb on enemy targets if ordered by the president. The 301st Bombardment Wing at MacDill Air Force Base, Florida received some B-50As reassigned from Davis–Monthan in early 1951, but used them for non-operational training pending the delivery of B-47A Stratojets in June 1951. The B-50 was built as an interim strategic bomber to be replaced by the B-47 Stratojet, but delays to the Stratojet forced the B-50 to soldier on until well into the 1950s. A strategic reconnaissance version of the B-50B, the RB-50 was developed in 1949 to replace the aging RB-29s used by SAC in its intelligence gathering operations against the Soviet Union. Three different configurations were produced, which were later redesignated RB-50E, RB-50F, and RG-50G respectively. The RB-50E was earmarked for photographic reconnaissance and observation missions; The RB-50F resembled the RB-50E but carried the SHORAN radar navigation system designed to conduct mapping, charting, and geodetic surveys, and the mission of the RB-50G was electronic reconnaissance. These aircraft were operated primarily by the 55th Strategic Reconnaissance Wing. RB-50Es were also operated by the 91st Strategic Reconnaissance Wing as a replacement for RB-29 photographic reconnaissance aircraft flown over North Korea during the Korean War. The vast northern borders of the Soviet Union were wide open in many places during the early Cold War years with little defensive radar coverage, and limited detection capability. RB-50 aircraft of the 55th SRW flew many sorties along the periphery, and where necessary into the interior. Initially, there was little opposition from the Soviet forces as radar coverage was limited and, if the overflying aircraft were detected, the World War II era Soviet fighters could not intercept the RB-50s at their high altitude. The deployment of the MiG-15 interceptor in the early 1950s made these flights exceedingly hazardous, with several being shot down by Soviet air defenses and the wreckage being examined by intelligence personnel. RB-50 missions over Soviet territory ended by 1954, replaced by RB-47 Stratojet intelligence aircraft that could fly higher near supersonic speed. The first KB-50 flew in December 1955 and was accepted by the Air Force in January 1956. The tankers steadily entered the operational inventory of Tactical Air Command (TAC) supplanting TACs KB-29s. By the end of 1957, all of the command's aerial refuling squadrons had their full complement of KB-50s. KB-50s, and later KB-50Js with two General Electric J47 jet engines were used by TAC, and also by USAFE and PACAF overseas as aerial tankers. Some were deployed to Thailand and flew refueling missions over Indochina in the early years of the Vietnam War until being retired in March 1965 due to metal fatigue and corrosion. In addition to the aerial tanker conversion, the Air Weather Service by 1955 had worn out the WB-29s used for hurricane hunting and other weather reconnaissance missions. Thirty-six former SAC B-50Ds were stripped of their armament and equipped for long-range weather reconnaissance missions. The WB-50 could fly higher and faster and longer than the WB-29. However, between 1956 and 1960 it experienced 13 major operational accidents, six of them involving the loss of the entire crew, and 66 crew member fatalities. After the weather reconnaissance fleet was grounded in May 1960 because of fuel leaks, plans were set in motion in 1962 to modify Boeing B-47 Stratojets being phased out of SAC to replace it in the role. The WB-50 had an important role during the Cuban Missile Crisis, when it monitored the weather around Cuba to plan photo-reconnaissance flights. The WB-50 was finally retired in 1965 due to metal fatigue and corrosion. One B-29A was handed over to Pratt & Whitney to be used as a testbed for the installation of the new Wasp Major 28-cylinder engines in the B-29. Wasp Major powered bomber, with stronger structure and taller tail. Redesignated B-50A in December 1945. First production version of the B-50. Four R-4360-35 Wasp Major engines, 168,500 pounds (76,400 kg) max take-off weight. A total of 79 were built. TB-50A – Conversion of 11 B-50As as crew trainers for units operating the B-36. Improved version, with increased maximum take-off weight 170,400 pounds (77,300 kg) and new, lightweight fuel tanks. 45 built. EB-50B – Single B-50B modified as test-bed for bicycle undercarriage, later used to test "caterpillar track" landing gear. RB-50B – Conversion of B-50B for strategic reconnaissance, with capsule in rear fuselage carrying nine cameras in four stations, weather instruments, and extra crew. Could be fitted with two 700-US-gallon (2,650 L) drop tanks under outer wings. 44 converted from B-50B. Prototype for B-54 bomber, to have Variable Discharge Turbine (i.e. turbo-compound) version of the R-4360 engine, longer fuselage and bigger, stronger wings. One prototype started but canceled before completion. Definitive bomber version of the B-50. Higher max takeoff weight (173,000 pounds (78,000 kg)). Fitted with receptacle for Flying boom in-flight refueling and provision for underwing drop tanks. Modified nose glazing with 7-piece nose cone window was replaced by a single plastic cone and a flat bomb-aimer's window. A total of 222 were built. DB-50D – Single B-50D converted as drone director conversion of a B-50D, for trials with the GAM-63 RASCAL missile. KB-50D – Prototype conversion of two B-50Ds as three-point aerial refueling tanker, using drogue-type hoses. Used as the basis for later production KB-50J and KB-50K conversions. A further conversion from a TB-50D was also designated KB-50D. TB-50D – Conversion of early B-50Ds lacking aerial-refueling receptacles as unarmed crew trainers. Eleven were converted. WB-50D – Conversion of surplus B-50Ds as weather reconnaissance aircraft to replace worn out WB-29s. Fitted with doppler radar, atmospheric sampler and other specialist equipment, and extra fuel in the bomb bay. Some were used to carry out highly classified missions for atmospheric sampling from 1953 to 1955 to detect Soviet detonation of atomic weapons. 14 RB-50Bs converted at Wichita for specialist photographic reconnaissance. Conversion of 14 RB-50Bs as survey aircraft, fitted with SHORAN navigation radar. Conversion of the RB-50B for electronic reconnaissance. Fitted with Shoran for navigation, and six electronic stations, with 16-man crew; 15 converted. Unarmed crew trainer for B-47 squadrons. 24 completed, the last B-50s built. All later converted to KB-50K tankers. AF Ser. No. 46-0010 Lucky Lady II – The first plane to fly around the world nonstop, between February 26 and March 2, 1949. Was refueled four times in air by KB-29 tanker planes of the 43rd Air Refuelling Squadron, over the Azores, Saudi Arabia, the Philippines and Hawaii. The circumnavigation took 94 hours and 1 minute, and covered 37,743 km (23,452 miles) at an average speed of 398 km/h (249 mph). Lucky Lady II was disassembled after a serious accident and its forward fuselage is stored outside at Planes of Fame Air Museum in Chino, California. AF Ser. No. 49-0310 – National Museum of the United States Air Force at Wright-Patterson Air Force Base in Dayton, Ohio. AF Ser. No. 49-0351 Flight Of The Phoenix – Castle Air Museum at the former Castle Air Force Base in Atwater, California. This was the last B-50 to be flown, being delivered to MASDC at Davis–Monthan Air Force Base, Arizona, on 6 October 1965. It was put on display at the Castle Air Museum in 1980. AF Ser No. 49-0372 – Pima Air & Space Museum adjacent to Davis-Monthan Air Force Base in Tucson, Arizona. AF Ser. No. 49-0389 – Air Mobility Command Museum in Dover, Delaware. Formerly an outdoor display at MacDill Memorial Park at MacDill Air Force Base in Tampa, Florida. In 2018, 49–0389 was dismantled and moved a thousand miles to the Air Mobility Command Museum in Dover, Delaware, where the air frame is being repaired before reassembly. ^ The new tail had also been tested on a B-29 testbed, s/n 42-24528, although unlike the XB-44, it was not given a separate designation. ^ "Serial Number Search, B-50 48-065." rcn.com. Retrieved: 8 August 2010. ^ a b c Knaack 1988, p. 163. ^ a b c d e f g h i Bowers, Peter M. (1989). Boeing aircraft since 1916 (3rd ed.). London: Putnam. pp. 345–352. ISBN 0851778046. ^ a b "Boeing/Pratt & Whitney XB-44 factsheet." Archived June 20, 2008, at the Wayback Machine National Museum of the United States Air Force. Retrieved: 27 June 2010. ^ a b Peacock 1990, p. 204. ^ "XB-44 Superfortress Factsheet." Archived June 20, 2008, at the Wayback Machine National Museum of the United States Air Force. Retrieved: 28 December 2012. ^ a b Knaack 1988, pp. 181–182. ^ Willis 2007, pp. 162–163. ^ Willis 2007, p. 162. ^ a b Peacock 1990, pp. 205–206. ^ Willis 2007, pp. 156–158. ^ Knaack 1988, pp. 186–187. ^ "On Permanent Alert." Popular Mechanics, November 1950, pp. 91–94, see bottom page 92. ^ a b c Ravenstein, Charles A. Air Force Combat Wings Lineage and Honors Histories, 1947–1977. Maxwell AFB, Alabama: Office of Air Force History, 1984. ISBN 0-912799-12-9. ^ Baugher, Joe. "Boeing B-50B Superfortress." USAF Bombers: Boeing B-50 Superfortress, 17 June 2000. Retrieved: 8 August 2010. ^ a b "Boeing F-13A / RB-29A / RB-50." Archived 2018-09-30 at the Wayback Machine Spyflight.com. Retrieved: 8 August 2010. ^ Baugher, Joe. "Boeing KB-50 Superfortress." USAF Bombers: Boeing B-50 Superfortress, 17 June 2000. Retrieved: 8 August 2010. ^ Baugher, Joe. "Boeing WB-50D Superfortress." USAF Bombers: Boeing B-50 Superfortress, 17 June 2000. Retrieved: 8 August 2010. ^ "Boeing B-50A Factsheet." Archived June 16, 2012, at the Wayback Machine National Museum of the United States Air Force. Retrieved: 28 June 2010. ^ a b Peacock 1990, p. 205. ^ "B50B Factsheet." Archived July 5, 2012, at the Wayback Machine National Museum of the United States Air Force. Retrieved: 28 June 2010. ^ "Favonius." "American Notebook: Some Caterpillars Fly." Flight, 7 July 1949, p. 24. ^ "RB-50B Factsheet." Archived June 16, 2012, at the Wayback Machine National Museum of the United States Air Force. Retrieved: 28 June 2010. ^ Knaack 1988, p. 177. ^ "YB-50C Fact sheet." Archived August 6, 2009, at the Wayback Machine National Museum of the United States Air Force. Retrieved: 28 June 2010. ^ "B-50D Factsheet" Archived June 16, 2012, at the Wayback Machine. National Museum of the United States Air Force. Retrieved: 28 June 2010. ^ "DB-50D Factsheet." Archived June 16, 2012, at the Wayback Machine National Museum of the United States Air Force. Retrieved: 30 June 2010. ^ "KB-50D Factsheet." Archived August 6, 2009, at the Wayback Machine National Museum of the United States Air Force. Retrieved: 30 June 2010. ^ a b Peacock 1990, p. 206. ^ "TB-50D Factsheet." Archived August 17, 2011, at the Wayback Machine National Museum of the United States Air Force. Retrieved: 30 June 2010. ^ "Boeing WB-50D Superfortress." Archived November 15, 2007, at the Wayback Machine National Museum of the United States Air Force. Retrieved: 30 June 2010. ^ a b Peacock 1990, p. 207. ^ Knaack 1988, pp. 195–196. ^ "Boeing RB-50E." Archived August 6, 2009, at the Wayback Machine National Museum of the United States Air Force. Retrieved: 30 June 2010. ^ Knaack 1988, pp. 178–179. ^ RB-50F Factsheet." Archived August 8, 2009, at the Wayback Machine National Museum of the United States Air Force. Retrieved: 30 June 2010. ^ a b Knaack 1988, p. 179. ^ Knaack 1988, pp. 197–199. ^ "B-50 Superfortress, s/n 46-010 'Lucky Lady II'." Archived 2017-08-06 at the Wayback Machine Planes of Fame Museum. Retrieved: 13 April 2012. ^ "WB-50D Superfortress, s/n 49-0310." National Museum of the United States Air Force. Retrieved: 14 December 2017. ^ "WB-50 Superfortress, s/n 49-0351." Castle Air Museum. Retrieved: 14 December 2017. ^ "KB-50 Superfortress, s/n 49-0372." Pima Air & Space Museum. Retrieved: 9 April 2012. ^ "KB-50J Superfortress Restoration Underway" Air Mobility Command Museum Retrieved: 04 February 2018. ^ Maurer, Maurer, ed. (1982) . Combat Squadrons of the Air Force, World War II (PDF) (reprint ed.). Washington, DC: Office of Air Force History. ISBN 0-405-12194-6. LCCN 70605402. OCLC 72556. .
^ Tabaco, Joseph. "Air Force Weather Reconnaissance Organizational History." Archived July 13, 2010, at the Wayback Machine tabacofamily.com. Retrieved: 23 August 2010. ^ "Tactical Tankers: KB-29/KB-50, 1953–1965." TAC Tankers.Com. Retrieved: 23 August 2010. ^ Knaack 1988, pp. 200–201. Peacock, Lindsay. "The Super Superfort". Air International, Vol. 38, No 4, April 1990, pp. 204–208. Stamford, UK: Key Publishing. ISSN 0306-5634. Hays, Geoffrey (2013). Boeing B-50. Air Force Legends. Nº215 (First ed.). California, United States: Ginter Books. ISBN 978-0-9846114-9-2. Retrieved 1 February 2015. Wikimedia Commons has media related to B-50 Superfortress.